Pharmacists are a vital resource for people in the community and have an important role in supporting self care. To support them, Bayer Consumer Health has introduced a new business skills training programme, Business Fit for the Future, which aims to build business confidence to help community pharmacies achieve long-term success. Despite widespread recognition that business skills are an important part of running a successful community pharmacy, new research by Bayer Consumer Health has shown that more than a third (38 per cent) of pharmacists are not comfortable with the selling side of their business and many feel they are not equipped with the commercial skills to lead and manage their pharmacy in a sustainable way1. In response, Bayer has launched a new business skills training programme called Business Fit for the Future which aims to build business confidence to help community pharmacies achieve long-term success. The National Pharmacy Association (NPA) accredited skills training will help pharmacy teams better understand today’s patient population with practical exercises to help them see how they can use this knowledge to unlock opportunities for business growth. Developed by pharmacists, for pharmacists, the training resources aim to positively impact the bottom line as well as upskill pharmacy team capabilities to retain customers long-term. “Our research has shown that pharmacists see themselves as healthcare professionals first, business managers second,”2 “But with all the environmental challenges facing the profession, a mindset shift is needed if today’s community pharmacy professionals are to not just survive but thrive in the future.” remarks Mark Ackland-Snow, Bayer Consumer Health’s Head of Category, Commercial Strategy and Shopper Marketing. 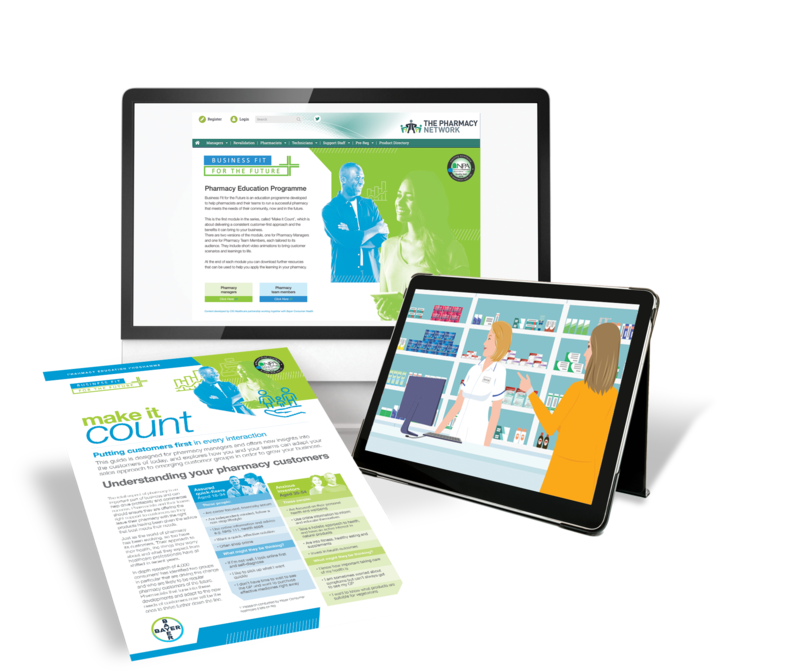 The training resources are available in a variety of formats to suit different learning needs with content for pharmacy managers as well as versions for pharmacy staff. Visit the website to download your copy and view the interactive animated videos that support the training. The resources have been developed by Bayer’s Consumer Health team. Bayer is a Member of PAGB. 1, 2 Business Skills in Pharmacy Research. June 2018. Conducted for Bayer Consumer Health.